A good friend and I went to indulge ourselves with dimsum and other Chinese specialties at King Chef Dimsum Kitchen along Banawe, Quezon City. 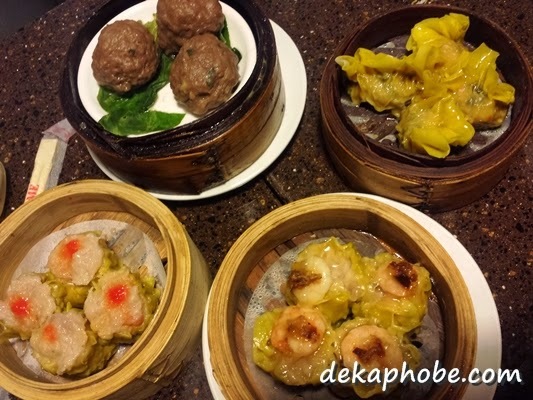 Not to be confused with King Chef Fine Dining (which is located on the same street), King Chef Dimsum Kitchen is located at 238 Banawe Center. Chef Nicole of Nora's Homemade Frozen Delights was kind enough to tell me about King Chef's tea time, where dimsum prices are discounted. Daily tea times are from 8:00AM to 10:00AM (morning), 2:00PM to 5:00PM (afternoon) and 9:00PM to 12:00MN (late night). We took advantage of the discounted prices and had a late night dimsum feast. Gino's Brick Oven Pizza has finally come to Ortigas! Owned by the same people behind Cello's Doughnuts and Dips, Gino's has become a favorite haven in Katipunan area for pizza lovers. It has now opened branches in Makati and most recently, at the Podium in Ortigas Center. I was impressed particularly with the live plants as wall decors. Nothing is more beautiful than nature, isn't it? Aside from the usual condiments you see in an Italian restaurant, this peculiar pizza condiment piqued our interest: Gino's Spicy Honey. But did you know that the perfect temperature for Coke is 3 degrees Celsius? How do you turn Coke into the #PerfectCoke? 1. Store your Coke bottles inside the cooler (or Coke barrel) with lots of ice. After our healthy lunch at The Wholesome Table, my friends and I walked towards Farmacy to try their desserts. Well, one of my friends thought we were actually going to Watson's to buy meds and only realized that deception when he saw the resto signage. hehe. Back in the old days, pharmacies or drug stores used to serve soda fountains and ice cream hence the design and name of this newly-opened dessert shop. Bar stools are available inside the resto while tables & chairs are available outside due to limited space. Located beside Wildflour, its sister restaurant, Farmacy's menu is straightforward with only a three items on their lunch menu (available from 12 noon to 6pm). After our awesome lunch at Silantro, we headed north to meet a college friend at Cafe Breton, UP Ayala Technohub. I have been to Cafe Breton several times before, but I haven't really explored their menu. It was only during this visit that I realized that they serve ice cream parfaits, milkshake and other savory dishes apart from the coffee and crepes. I went back to Crazy Chicken in Marikina to get my hands on Black Listed Wings, also known as Chocolate Chicken. This flavor is not entirely sweet, with a nice kick of spiciness as you bite into it. It was so memorable that I had to drag a friend to satisfy my week-long craving for chicken wings. While we shared a Wings Solo (Php 109) of Black Listed Chicken, we opted to try their Insanity Burgers as well. Great mornings start with a great breakfast, because there’s nothing like waking up to the thought of having your classic favorites for your most important meal of the day. 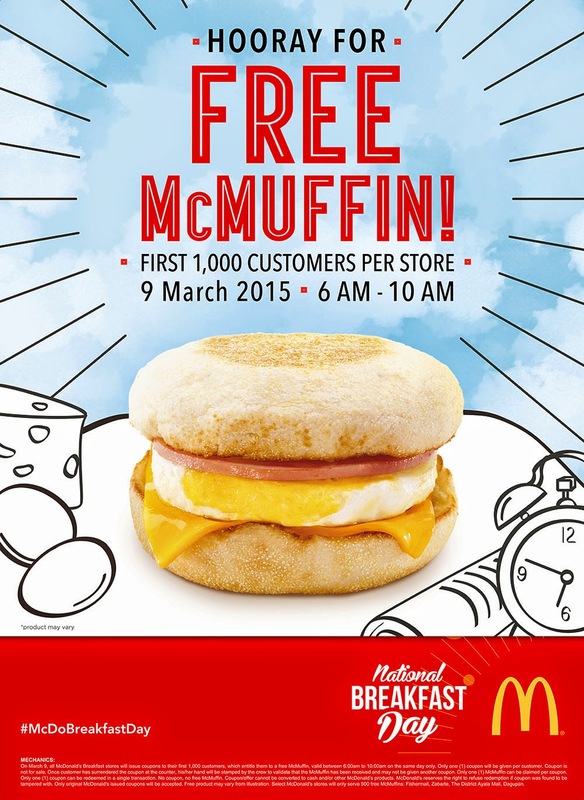 McDonald’s once again shares the goodness of a McDonald’s breakfast through the 3rd National Breakfast Day. On March 9, McDonald’s celebrates the “world’s biggest breakfast” where all participating McDonald’s restaurants nationwide and in other countries will each give away a free McMuffin for the first 1,000 customers starting 6:00 a.m.
Customers may line-up at the front counter for their free Egg McMuffin, or go for a Drive-Thru visit on their way to work. It is not a secret on how much I love ice cream. Moreover, I love artisanal ice cream flavors. I was glad to be introduced to Nora's Homemade Frozen Delights, a local ice cream brand from Baguio City. Named after Chef Nicole's grandmother, Nora's Homemade Frozen Delights proudly uses main ingredients fresh from Baguio, including the fresh cow's milk and yogurt from Baguio Dairy Farm. Unique flavors are Good Shepherd's Alfajor and Ube, Benguet Coffee and Strawberry Frozen Yogurt. We got to try other delicious flavors such as Chocolate Campfire Marshmallows, Blueberry Cheesecake, Cookie Dough and Lychee Yogurt Sorbet.